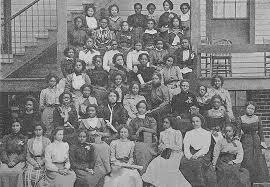 Kittrell Normal and Industrial School was founded in 1886 by the North Carolina Conference of the Methodist Episcopal Church. The school was incorporated in 1887. Originally a high school, it was designed to teach poor Black children. In 1892 the Methodist Episcopal Church enlarged Kittrell's district to include Virginia, Maryland and the District of Columbia. The 1900 catalog shows a very small school with six students in the collegiate division, 48 in the high school/normal division, and 52 in the English/elementary division. There were 22 additional students in music, seven in night classes, three primary students and one student in dressmaking. The Prospectus shows the following departments: primary (grades 1-5), grammar (6-8), academic/normal (9-12) and collegiate (four years).